Three new Qwiic sensor boards for plenty of different applications, as well as four LED packs with built-in resistors! How's it going, everyone? Welcome to another new product-filled Friday post! This week, as we are sure you can tell from the post name, we have three new Qwiic boards graduating from SparkX prototypes to full-fledged SparkFun breakout boards: an IMU utilizing the BNO080 IC, the Grid-EYE IR Array sensor, and a tri-axial MLX90393 magnetometer board! That's not all, though! We also have four different colors of 5mm LEDs with built-in resistors for you as well! Additionally, in celebration of May the Fourth be With You, we have having a big sale on all of our Thank the Maker Tees to make room for our next limited-edition SparkFun shirt. Supplies are running low, and once stock runs out we won't be ordering any more! Make sure to get yours today! Alright folks, let's jump in and take a closer look at everything we have! 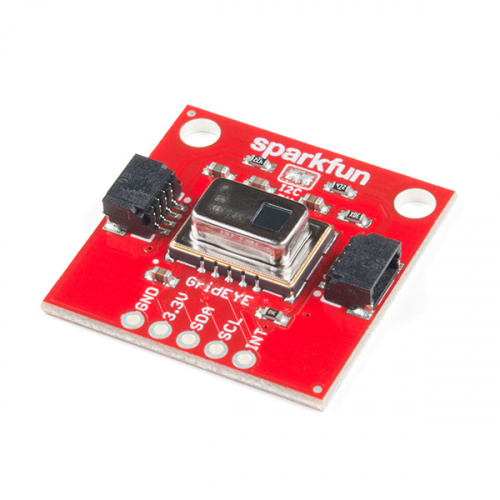 Virtual becomes Reality with the SparkFun VR IMU Breakout! Virtual Reality is in, but you shouldn't have to drop hundreds of dollars to gain access to the technology behind it. Luckily, that's where the SparkFun VR IMU Breakout comes in. At its heart is Bosch’s BNO080, a combination triple axis accelerometer/gyro/magnetometer SiP, packaged with a 32-bit ARM Cortex M0+. The BNO080 Inertial Measurement Unit (IMU) produces accurate rotation vector headings, excellently suited for VR and other heading applications with a static rotation error of two degrees or less. The VR IMU is exactly what we’ve been waiting for: All the sensor data is combined and drift-corrected into meaningful, accurate IMU information. It’s perfect for any project that needs to sense orientation or motion. This IMU breakout board has also been equipped with two I2C Qwiic connectors to make interfacing with the tiny, QFN package a bit easier. It’s part of SparkFun’s Qwiic connect system, so you won’t have to do any soldering to figure out how things are oriented. However, we still have broken out 0.1"-spaced pins in case you prefer to use a breadboard. Get ready to see like the Predator! 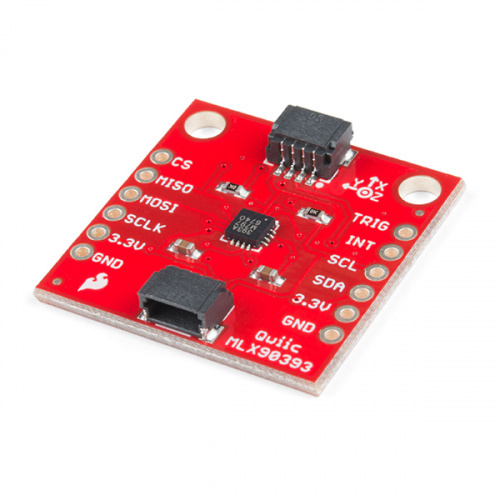 The SparkFun Grid-EYE Infrared Array Breakout board is an 8x8 thermopile array, meaning you have a square array of 64 pixels, each capable of independent temperature detection. It’s like having a thermal camera, just in a lower resolution. The on-board AMG8833 Grid-EYE possesses an accuracy rate of ±2.5°C (±4.5°F), with a temperature range of 0°C to 80°C (32°F to 176°F). Additionally, this IR "camera" board can detect human body heat at about 7 meters or less (that's about 23 feet), and has a frame rate of 10 frames a second to one frame a second. It's time to start utilizing the superior magnetometer, and what better way than to throw it onto an easy-to-use breakout board? 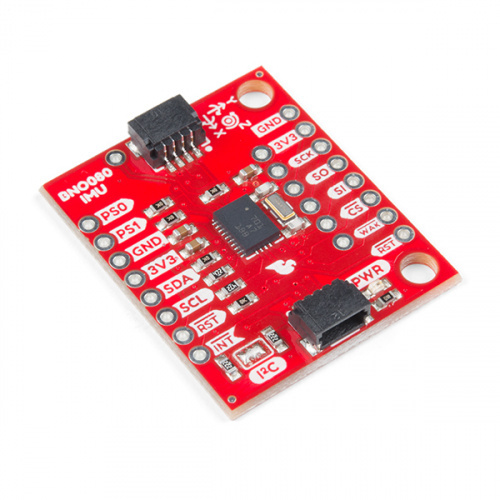 The SparkFun MLX90393 Magnetometer Breakout is a triple-axis magnetic sensor board capable of sensing very small fields (like the Earth’s magnetic field), while still behaving as one would expect during saturation in larger fields (like a nearby magnet). The MLX90393 breakout can be used as a compass sensor, but also works well as a non-contact controller, a flow meter with a magnetic impeller, or a linear actuator position sensor. Last up on this fine Friday we have four different LEDs for you. 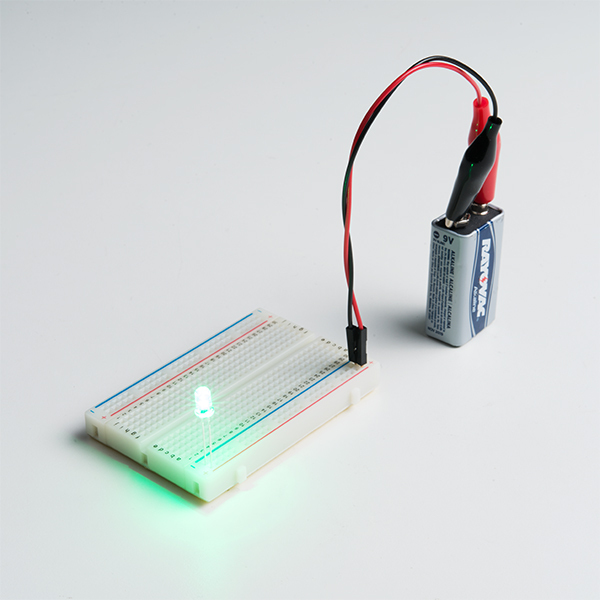 You don't have to worry about adding a resistor to an LED if you get an LED with a built-in resistor! 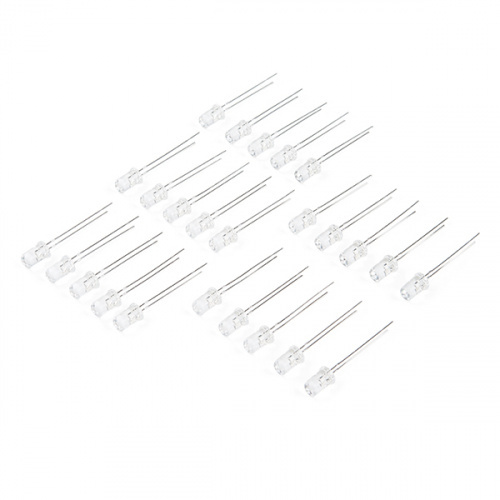 These packs of 25 red, yellow, blue, or green 5mm LEDs will help keep you from burning them out, since there is a resistor in the diode itself. Each LED should really help make your next project shine! Alright folks, that's it for this week. Please make sure to stop by next week, you'll definitely want to take a bite out of the new products we have in store for you! As always, we can't wait to see what you make with these products! Shoot us a tweet @sparkfun, or let us know on Instagram or Facebook. We’d love to see what projects you’ve made! ATAN2() is available in many programming languages and will do that last step for you. The datasheet says something about 5V for the forward voltage. Testing it out @ 5V, it pulls about 18mA. It has been working fine at 9V and pulls about 30mA. This is probably at the higher end of the input voltage. (PS: Any higher, I'd be worried. At about 16V, the LED blew out under our stress tests). I was wondering about the 9V battery when the max operating range is listed as 5V. I am very appreciative when Sparkfun does in-house testing of their product and publishes results.